Currently, our main support channel is on the Embarcadero Newsgroups. 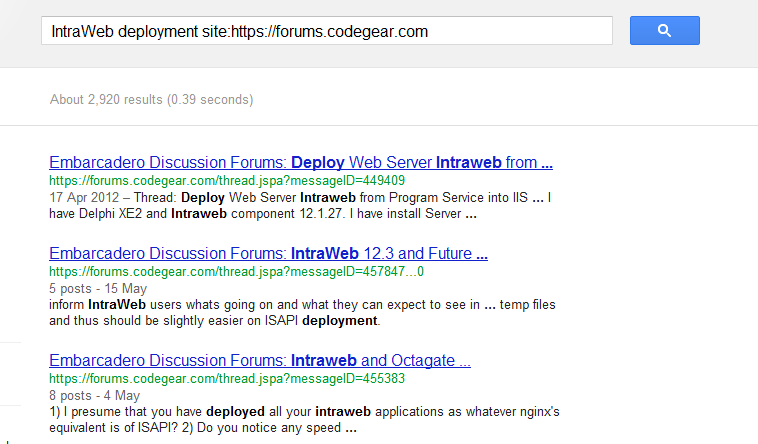 As you may know, there is a specific forum for IntraWeb on the Embarcadero newsgroups server. For web access, use https://forums.codegear.com/forum.jspa?forumID=93. Note that Embarcadero uses a self singed certificate and your browser will warn you about this. Accept it to enter the web forums. For NTTP access, use the instructions in http://edn.embarcadero.com/article/38435. For NTTP access, use your prefered NTTP client, as for example Mozilla Thunderbird. We also run a IRC chat and you ocasionally can chat with the support team and other IntraWeb users. BersircÂ - Small, lightweight and very nice! My personal favourite. Unfortunately Bersirc is DEAD DEAD DEAD. The client runs fine and its easy to use. But forget about docs (Site offline), source (site offline), or even its IRC channel (server offline)! Freenode WebchatÂ - Join instantly without installing any software. IceChatÂ - Open source, written in C#. HydraIRCÂ - Website has been offline for several weeks, but supposedly very nice. MibbitÂ - Web based chat. VisualIRCÂ - Scriptable and with a lot of nice customization features. Although we try to support all users, paid users receive priority. As we also run our priority support on the Embarcadero forums, if you are a priority user you just need to identify yourself as such and our support team will give special attention to your posts. Use a subject that clearly defines your problem: This will help subsequent visitors to the newsgroup accurately identify your question/problem and know if they can help you. A subject line of "Help Me" says very little about your problem whereas "How to populate a IWComboBox" lets everyone know what you need. State your question clearly, using reasonably good grammar so the actual problem can be understood. If people cannot understand what your problem is, they cannot help you. It’s ok if English is not your primary language. If you want, you can make a note in the beginning of your post so that others understand. Just try your best when writing your question. Describe the problem the most as you can, including details of what you are trying to achieve, what you have done, a link to an online example of your problem, state the exact steps needed to recreate what you are experiencing, etc.